While the experience of witnessing Didier Drogba fittingly end his time as a blue by finally ending our quest for the illusive Champions League title was a moment that I’m sure only occassions such as weddings and births of children could come close to (unlikely), there was an undoubtable feeling that this was the beginning of something fresh at Chelsea. A new dawn. A focal moment of transition from one era to another. All the pain and misery of failing near the final hurdle being put to rest at last, just as it felt as though the John Terry’s and Frank Lampard’s of our team would never get their hands on one. But how do we go one step better? From watching last season’s opening game at Stoke, which ended goalless, and from the first home game against West Brom, you couldn’t help but feel the lack of optimism. Who was saying: “I think Chelsea can challenge United and City this year?” Not many. With the position we find ourselves in, we should be aiming for league titles every season. According to many people, Andre Villas Boas’ needed to be given time to bring about a time of transition that we were going through. But all I could think was: “What transition?” The only players who left us permanantly last summer was Yury Zhirkov, hardly a first team rehualr in the first place, while the only signings who made a genuine difference to our fortunes were Juan Mata and Gary Cahill after signing in January. Hardly transition. I couldn’t help but groan over the same old approach to going forward, and the same one-paced movement. It was the same lack of pace visible that I believe lead to Ancelotti’s sacking. However, this year feels different. From what I’ve seen of Eden Hazard and Oscar, they both seem comfortable on the ball and can make things happen. Marko Marin brings that element of pace needed, and while it was obviously upsetting to see Drogba exit the club, there was an underlying thought that given his age and lack of consistency it was the right time. It’s also fair to say I haven’t lost a lot of sleep over letting Kalou and Bosingwa go. There is a general idea that we will have more fizz about us in the final third, combined with the solidity of the more experinced players and excitement of youngsters coming through. People are taking notice of us again, and while we may not yet be in a position to win the title yet, we certainly have more tools to challenge for it than last year. This is obviously excluding our heroic Champions League performances from last season, but again focusing on the domestic front. Against the five teams that finished above us last season, we won two games out of ten, those coming in the 3-0 victory at Newcastle and 2-1 home win against Manchester City. Not good enough I’m afraid. Perhaps the top teams found it easy to work us out, or our usual resilience wasn’t there. The 3-1 loss away to Man United and 3-5 defeat against Arsenal were both examples of a cringeworthingly bad defence, exposing AVB’s naivety. The loss of a 3-0 lead at home to United without doubut should not happen at the highest level.When the fight was on for fourth, our defeats at City and at home to Newcastle came about due to negativity and lack of spark. Mourinho and Ancelotti formed title winning teams on the back of tactical awareness against the toughest of oppsition, and in our championship winning seasons our results in those games were on the most part positive. 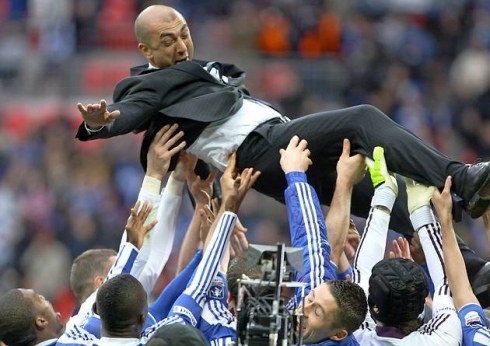 Di Matteo showed against Barcelona and Bayern Munich that he possesses this, particularly when pullimg off masterstrokes like selecting Ramires on the left wing at home to Barca to exloit Daniel Alves’ weaknesses and Ryan Bertrand in the same position against Bayern as a defensive option. With morale being as it is at the moment, I expect these results to improve next season. Mceachran, Romeu, Bertrand, Courtois, Piazon. There is a conveyor belt of young talent ready to ease into the side over the next few years. But so often we loan them out time after time before moving them on. Mceachran’s loan move to Swansea did not pay off, so I would like to see us sell a few midfielders to give him and Romeu chances. They both have technical ability, and can both tackle and pass the ball well. We need to make it clear to players like this how we see their role at the club. Romelu Lukaku complained about his lack of opportunities last season, and questioned whether we were jsut throwing money around. While I personally do not see anything anywhere near £18 million worth of talent, why was he lead to believe other wise? If these players could just be told whether they are good enough or not, or need to go out on loan from the start, this will make their competetive edge stronger. We need to decide once and for all if we are going to continue to spend money, or finally give young players chances to prove themselves, rather than leave them to waste in the reserves before selling them. Seems simple, but AVB was the example of how this can go so wrong. I have never believed that his time as manager went pear-shaped because he didn’t respect the senior players or tried to bring about change too quickly. He was just too inexperienced for the role. His treatment of Alex and Anelka bordered on being pathetic, and I think that was the moment the dressing room was lost. A more experienced boss may have just respected that they had handed in transfer requests and moved them on without fuss. It can’t have been easy for the likes of Terry to see his team-mates who he looked after being treated like that. Things like that and the needless rant at Gary Neville for making a fair point about David Luiz’s inefficiencies last season brought about anxiety and a lack of cohesion. Put basically, treat them like adults and don’t be so paranoid is the lesson. Di Matteo made sure last season that he didn’t alienate anoyone last season, thus giving the likes of Kalou and Ferreira more game time. The players clearly responded to his management style, and keeping things calm and disciplined will be the way forward. Overall, the mood around the club seems more healthy than this time a year ago, but if these points are addressed and we don’t stand still, this could be another memorable season. Pre-season may not have gone perfectly, but a good result at Wigan on August 18th can put that to bed. Here’s to another heart-wrenching but exhilarating season. I think our biggest concern has been in the two midfield roles in RDM’s 4231. While Mikel is comfortable in that position, he lacks pace. Essien is unlikely to be the beast he was, and Lampard, well, is not a natural ball winner. Meireles has been our worst passer by a long way!! In addition, this formation requires quick vertical movement of the ball up the pitch to the three creators. However, given our existing midfielders are all used to side to side passing from our 433 past, we seriously lack attacking agility. Those creators will be marked and forced deeper if the team doesn’t penetrate vertically quickly enough. We need midfielders who release quickly, and can defend with pace. We need an Alex Song! This type of player will enable our creators to create, otherwise we could witness more frustration than ever before… On and off the field. You’ve got short memory, read your own articles from that time.